Back in 2016, I tracked the passing statistics for center backs in that summer’s European Championship tournament. This project confirmed the greatness of the likes of Sergio Ramos & Jerome Boatang, while raised some red flags for the likes of Gareth McAuley & Kari Arnason. My contention was that good ball-playing center backs were adept at transitioning the ball from the defensive third into midfield, while the elite were involved in driving play from midfield into the attacking third. Given that the passing data from the group stages of the Europa League is available via Statszone, I decided to replicate this project (with a few tweaks) for Celtic & Rangers. For Rangers, the stats will focus on Connor Goldson & Joe Worrall (while Nikola Katic’s stats will be referenced as a comparison to Worrall). Celtic has relied on Dedryck Boyata in each Europa League match, while rotating in others alongside him. I’ll include Filip Benković even though he’s only featured in two matches, largely because I think he has been a key addition to the Celtic squad this season & may be the best centre back in the league. Let’s start with overall pass completion rate. I normally ignore pass completion rates as a meaningful stat. There is zero context when looking at an overall rate…but it does automatically flag one player here as being a concern. I wrote very early on about my concerns with Connor Goldson’s ability on the ball & I continue to wonder if he has been miscast as a ball-playing centre back in Rangers system. Let’s keep that in mind as we peel back the layers of the passing data. For the rest of this post, I’m only going to focus on forward passing. The goal is to evaluate these players as ball-playing centre backs & while maintaining possession with square passes & back passes is part of that role - I lean towards using forward passing to truly learn about who can handle being a ball playing center back. This is especially relevant for teams like Rangers & Celtic who will dominate possession in league play. Which center-backs can DRIVE possession & not just RETAIN possession? 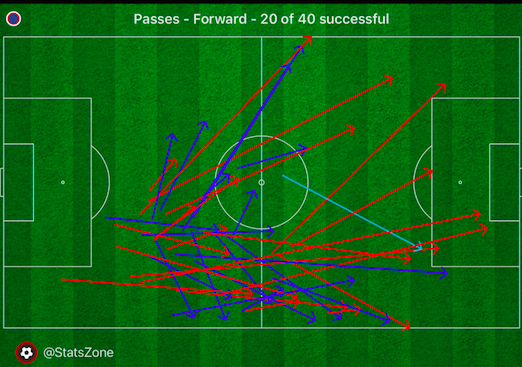 So, yeah…when asked to retain possession & make the easy pass - all four center backs are basically flawless. 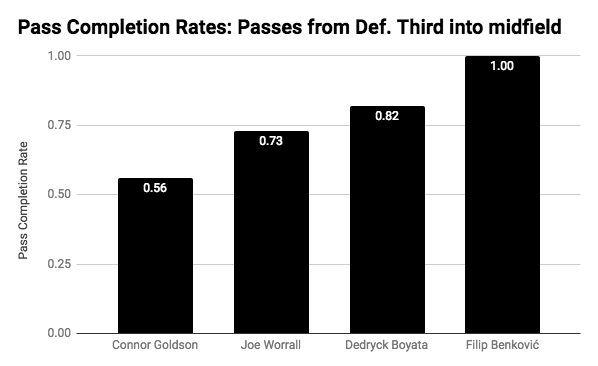 Now compare, Goldson & Worrall’s rates to their pass completion rates on forward passes. Goldson drops to 63%, Worrall to 78%. Boyata & Benkovic’s dips are less drastic. Both teams are relying on their center backs to drive possession up the pitch, but you can see that a player like Connor Goldson has to rely on his non-forward passes to pad his completion rate. Of all his passes, 69% are categorized as forward passes. 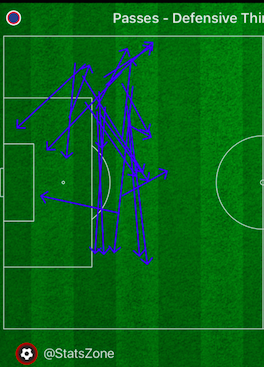 But when you look at his completed passes, forward passes only account for 61% of them. Compare that margin to Boyata & Benkovic. The point is that very little changes when the Celtic center backs look to drive possession rather than just maintain it, but when Rangers center backs do so….well, the results aren’t as seamless. Back in 2016, I included square passes here but this time I only counted forward passes. A comment from John Tortorella, the head coach of the NHL’s Columbus Blue Jacket, has influenced how I look at how defenders play while in possession in their own defensive area. Playing in transition can help generate high tempo play & a good ball-playing center back often can be the player who triggers that transition. This was my point of frustration with Goldson’s play when I tracked Defensive Third Exits earlier this season. Rather then look for a short pass to make, he relied on clearances that tended to lead to Rangers losing possession & being forced to play defense all over again. Goldson is the least likely of the players in this group to try a forward pass within the defensive third - which creates a small sample size. However, compare his results to Boyata who more than tripled the volume of passes & completed 100% of these kinds of passes. Even teammate Joe Worrall tends to be more nuanced on the ball in the defensive third. Below you’ll see Goldson’s passing in the defensive third from last Thursday’s loss to Spartak Moscow alongside Worrall’s defensive third passing in the opening match of group play against Villareal. Notice what happens whenever he looks to pass the ball forward. This is where you begin to really see the top ball playing center backs emerge. They are able progress the ball up the pitch without relying on a forced, aimless long ball. It should be noted that 100% of the long passes attempted by this group of center backs into the attacking third that originated in their own third failed. That’s why you want to see a defender who can pass into the midfield as part of a build up that relies on allowing your creative players to bring the ball up the pitch, rather then watch a ball punted from one end to another. For the record, Goldson had 80% of the attempted passes from the defensive third up to the attacking third & yeah, a 0% success rate. This is concerning if you are a Rangers supporter. Back when I did this for the Euros, I tracked 1,267 passes from center backs out of the defensive third into midfield & the average completion rate was 76%. 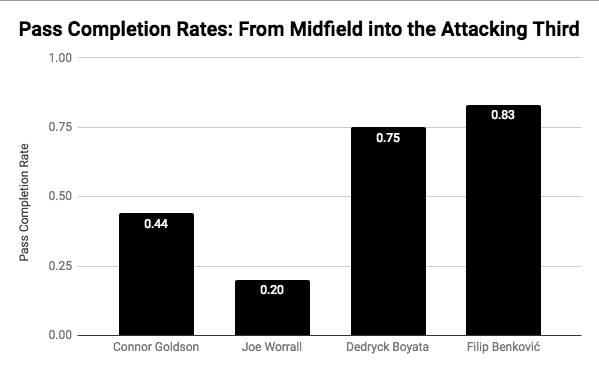 Both Rangers center backs have been below that rate, while Goldson has, quite frankly, been a liability when on the ball in the defensive third. For the Euros, I tracked 61 center backs passing & 90% of them had a better completion rate on passes out of the defensive third. If this trend continues for Goldson, teams would be smart to look to exploit Goldson’s struggles in an area of the pitch in which a turnover can quickly lead to a dangerous chance for the opposition. Goldson’s performance against Spartak Moscow at Ibrox epitomized his struggles at playing out of the back. All of those red lines signify times possession was lost at the end of a Goldson pass. The particularly dangerous ones are those failed pass attempts into the center of midfield (but still in Rangers half). If teams can force Goldson into these kinds of passes, they can be much more deliberate in designing quick counters if possession is turned over. For some context, let’s look at Dedryck Boyata’s out of the defensive third in Celtic’s away loss to Red Bull Leipzig. Each & every time Boyata played out of the defensive third, he was successful. You can assume that he got plenty of support from his midfielders, & in fact, he completed 35 passes (regardless of where he was on the pitch) to central midfielders in that match. In Goldson’s four Europa League matches, he has completed a total of 23 passes to central midfielders. As teams put a stranglehold on possession, center backs push up into play & keep the ball cycling in the midfield. Again, the stats below only account for forward passes. What really sticks out here is the fact that Goldson isn’t that involved in the midfield. Fillip Benkovic has more forward passing attempts in two matches, & Worrall has 21 more in one less match. I assumed that this may be due to Goldson relying on square passes in midfield but 78% of his passes in midfield are forward. 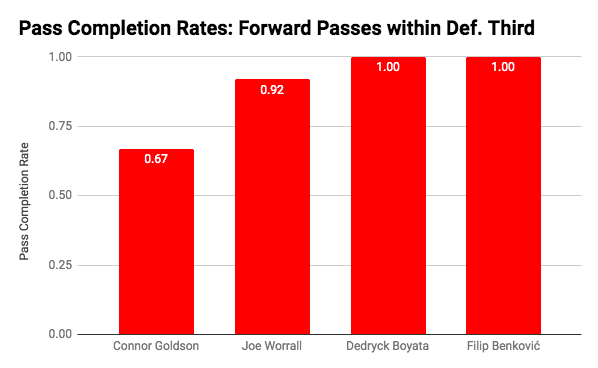 For context, 74% of Worrall midfield passes are forward. Is the lack of involvement of Goldson in midfield a tactical decision for Rangers? This seems like the right time to point out that Gareth McAuley (who turns 39 in December) had the worst pass completion rate within midfield in the 2016 Euros for all center backs. He completed 57% of his 23 attempted passes…the next worst was Ragnar Sigurdsson (who signed with Fulham that summer & now plays in Russia) who completed 78% of his midfield passes. Of the center backs who had at least ten passes within the defensive third, he had the fourth worst completion rate. The same hold true for passing out of the defensive third into midfield. It’s a super small sample size, but you could make a very strong argument that McAuley was among the very worst ball-playing centre backs in that tournament. Now, Rangers didn’t bring McAuley into the squad to be a ball playing center back, but given how much the team tends to dominate possession - it would make sense to prioritize center backs who are adept at passing & driving possession up the pitch. For example, Boyata isn’t necessarily known for his stout defending but it’s hard to find anyone who would question the value his ability on the ball adds to the team. This is where you begin to see the elite ball-playing center backs, defenders who are driving possession from midfield into the final third. Back when I tracked the European Championships, this is where the likes of Sergio Ramos, Jerome Boatang, & Gerard Pique led the way. All three had a completion rate of over 80%, while the average rate was 56%. Ok…we have another outlier here. Someone should probably tell Goldson to stop. He has attempted 32(!) passes from midfield into the final third & failed 56% of the time!?!? Think about it, overall Boyata has attempted 66 more passes than Goldson…but Goldson has EIGHT TIMES the amount of passes from midfield into the final third than Boyata?? Rangers have made a big investment in Goldson (he’s signed through the end of the 2021-22 season) & he definitely has been an upgrade over any other center back Rangers have fielded since their return to the Premiership. However, the stats suggest he has been miscast as a ball playing center back. Of course, one could take the approach that this is only a collection of stats from four matches & maybe Goldson’s numbers would look much better if we factored in his numbers from the Scottish Premiership. Now, we don’t have access to that kind of data - but if we did, do you really think the results would be markedly better? Ultimately, this is the kind of information that opponents could look to exploit when they play Rangers & is an example of how data can be used to identify strengths (& weaknesses) in a player’s game. As Rangers keep working towards eventually overtaking Celtic, they will likely need to have a quality ball playing center back (or two) anchoring the defence & I’m not sure that player is currently on the team. The last time I played around with these kinds of stats was when Rangers signed Clint Hill - who like McAuley was a year or two away from the end of his career. Rounding out the top five center backs in the 2016 Euros for passing the ball from midfield into the attacking third were Aleksandar Dragovic & Fabian Schär. Dragovic signed with Bayer Leverkusen that summer & later was loaned out to Leicester City. Schär has bounced around Europe since that summer & currently is in Newcastle United’s squad. This was written under the influence of The Audience, Dream Wife & Walter Martin.